When George Henry died – in the same year as his cousin Sarah – the inheritance passed to his wife, who died in 1850. The ownership of Aldenham House then passed to her son, Henry Hucks Gibbs, who, at that time, owned a house called St Dunstan’s, in Regent’s Park. He continued to live there until 1868, when he decided to move to Aldenham House. Henry Hucks Gibbs succeeded his uncle, William Gibbs, as a Senior Partner of the City banking house, Antony Gibbs & Sons, in 1872 – William was the last surviving son of Antony, and the then owner of Tyntesfield. Henry Hucks was elected MP for the City of London; became Chairman of the Conservative Association, and was appointed Governor of the Bank of England in 1875. When he moved into Aldenham House, he immediately set to work transforming the house and estate into a country residence befitting a man of his position – his first task being to renovate, improve and extend the rather ‘neglected and somewhat dilapidated’ house, which was a mammoth job in itself. With the help of his younger son, Vicary, and his Head Gardener Edwin Becket, he then turned his attention to the gardens, and established a collection of trees and shrubs on the estate that rivalled those at Kew. He specially prepared the soil to enable him to grow the rare and exotic plants sent back to England by the great Victorian explorers and, in 1907, his gardens were chosen from those throughout Europe to raise the seeds sent back from China by the horticulturalist, Ernest Wilson. Within two years, specimens of over 600 species and varieties of plants were being sent to botanic gardens all over the world. The Aldenham House Gardens were also reputed to contain a specimen of every tree growing in the western hemisphere, and, although this may have been a somewhat exaggerated claim, its collections of Yews, Oaks, Bamboos and Thorns were widely envied. These notes are very helpful, because they enable one to establish that James 2 and/or 3 worked on the Aldenham estate in both 1892 and 1897. 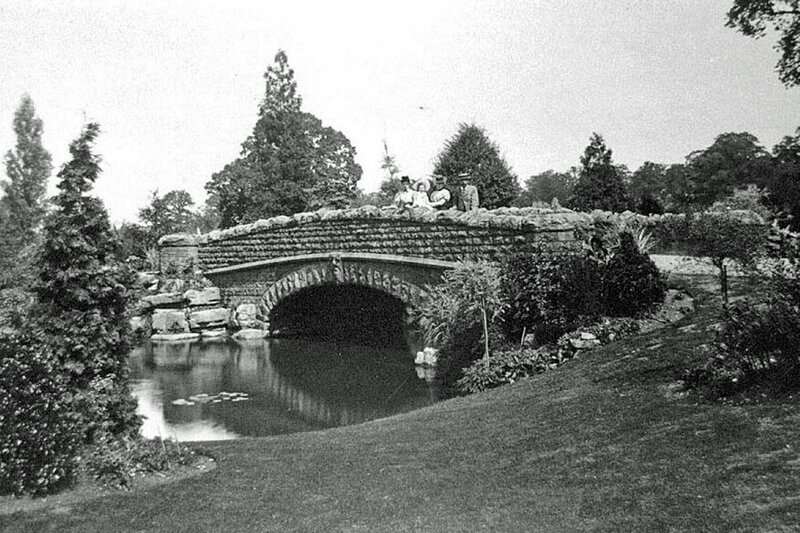 There are two Pulhamite bridges here – one ‘large,’ and the other ‘small’ – and Lord Aldenham’s book makes it clear that one was constructed during the first visit, and the other during the second visit – probably in the order suggested. Figs 1 and 2 are of the two bridges soon after their completion (c1900), and provide an opportunity to identify some people. The group on the ‘large bridge’ (Fig 1) consist of Mrs Pulham, a Miss Girton, a Mrs Girton, and Mr Edwin Beckett, the Head Gardener, while Mr Beckett can also be seen in Fig 2 greeting (presumably) Lord Aldenham on the ‘small bridge.’ Both bridges are excellent examples of the romantic ‘rusticated’ style of brickwork that is so typically ‘Pulham’ to everyone who admires their work. Fig 3 is another picture of Lord Aldenham – this time admiring his new rockwork along the banks of his ‘rocky stream’ – and Fig 4 shows a small cascade that falls into the ‘big pool,’ just below the ‘large bridge.’ The rocky stream can be seen leading towards the ‘small bridge’ in the distance. Both bridges are still in very good order, and Fig 5 shows what the ‘large bridge’ looked like during my visit in 2001 – not quite as pleasing to the eye as it was originally, due to the extra concrete support that was added beneath the arch in order to cater for the passage of heavy vehicles. Fig 6 is taken from along the side of the nearby rocky stream, and one can just see the ‘small bridge’ in the distance. The section of the stream that flows beneath the two bridges is effectively the centrepiece of Pulham’s work here, but he also did considerably more on either side. The water actually flows from a very large artificial lake near the entrance to the estate, through the stream and under the bridges, and into a swimming pool on its way over a number of weirs into a sump at the bottom level of the grounds. Fig 7 shows the old boathouse on the shore of the big lake – it is still there, but is now considerably overgrown – and Fig 8 is of the swimming pool. This was converted from an old fishpond, and is concrete lined, with a changing room that can be seen on the far bank. During the Second World War, this was reinforced, and used as an air-raid shelter, but its roof is now missing. Lord Aldenham’s son, Vicary, inherited the estate when his father died, but, after his own death in 1932, the family were unable to keep on the house and its estate staff of more than 100 people. The estate consequently fell into decline, but was taken over by the BBC as an overseas broadcasting station during the War. They stayed there for twenty years, by which time the grounds had been neglected for more than twenty years, and had deteriorated almost beyond recognition. The Haberdashers’ Company purchased the house and estate in 1959, with the intention of moving their Boys’ School from Hampstead. A great deal of very intensive work was done to clear the overgrowth, and restore as much as possible of the original gardens, as well as convert the house and some of the old buildings, and build a series of new school buildings until they were finally able to open the new Haberdashers’ Aske’s School for Boys on 11th October, 1961. It still thrives today, and, thanks to them, the gardens look a picture! Posted on July 31, 2013 June 4, 2016 by Claude HitchingPosted in Sites Month 2Tagged . . James Pulham and Son, Aldenham House, Edwin Becket, George Henry Gibbs, Haberdashers' Aske's, Henry Hucks Gibbs, Lord Aldenham.